Most homeowners don't realize they are responsible for repairing or replacing damaged underground piping and wiring located on their property. This is an expensive process and is not covered by most homeowners insurance policies. Losses can easily total $3,500 or more when considering repairs and excavation. Service Line coverage not only pays for your repairs, but also for any damage to outdoor property as a result of those repairs (e.g., driveways, walkways, lawns, shrubbery, and plants). If your home becomes uninhabitable due to the damage, coverage for your hotel and other expenses is included as well. 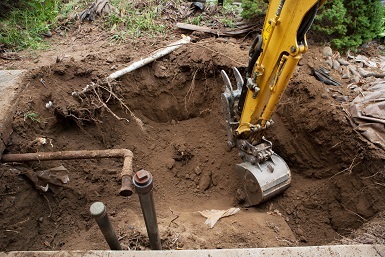 An underground sewer line on the insured's property was damaged by tree root growth. The driveway and surrounding landscape were damaged while repairing the sewer line. A large rock abuts an underground sewer line directly under the insured's sidewalk prior to entering the home. Years of wear mar the pipe and cause leakage requiring excavation and replacement of the pipe.